As part of our partnership with Jack Johnson for his 2014 “From Here to Now to You Tour”, and in conjunction with “All at Once”, a social action network connecting nonprofits with people who want to become active in their local and world community, OMG will be hosting an educational event at his upcoming concert on June 3, 2014 at theVerizon Wireless Amphitheater at Encore Park. All donations made before September 1st, 2014 at 12:00pm will be matched by The Johnson Ohana Charitable Foundation. All donations made before May 30th, 2014 at 12:00pm will be eligible to win two free tickets for the All at Once Atlanta premiere on June 3rd at the Verizon Wireless Amphitheater. The winner will be contacted on May 31st, 2014. The winner will receive 2 tickets to the June 3rd concert at the Atlanta Verizon Wireless Amphitheater: 2200 Encore Pkwy, Alpharetta, GA 30009. The doors will open at 6:00pm for the preshow that includes introductions with One More Generation and other supported non-profits. Jack Johnson Donates Tour Profits to Charity. 100% of Jack Johnson’s 2008 tour profits were used to establish the Johnson Ohana Charitable Foundation, founded by Jack and Kim Johnson to support environmental, art and music education now and into the future. The Johnson Ohana Charitable Foundation continues to support many All At Once non-profit partners. All At Once comes to life online at www.AllAtOnce.org and at the Jack Johnson concerts where you can get educated, get inspired, and connect face-to-face with us and other local and national non-profits. All At Once promotes sustainable local food systems and plastic free initiatives. 2) Participate in our Pre-Concert Event. OMG will be hosting our Plastic Pollution/Endangered Species Presentation at the Atlanta Botanical Garden on Endangered Species Day Saturday, May 31, 10 a.m. – 2 p.m. The Botanical Gardens are located at 1345 Piedmont Ave, N.E. Atlanta, GA 30309. OMG has partnered with the Botanical Gardens and we will be helping visitors understand the connection between animal conservation and what we are doing to our environment. We will obviously be focusing on the effects of Plastic Pollution on endangered species. Stop by to check out the presentation and come meet OMG founders Carter and Olivia in person. 3) Visit us at the show! We will be at Jack Johnson’s concert in Atlanta on June 3rd. at the Verizon Amphitheater. Please come visit us, take environmental action, and enter to win Best Seats in the House – a chance to watch the show from the side of the stage! 4) Help us raise funds! 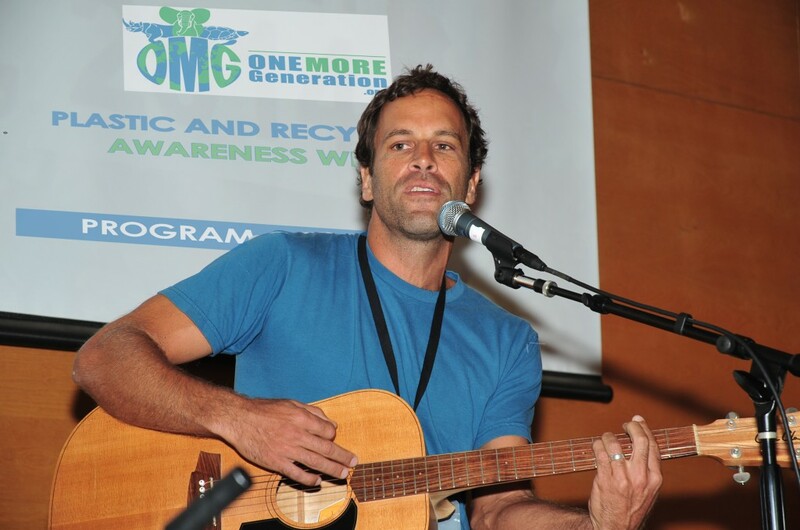 Jack Johnson’s charity is matching donations contributed to us at the show or directly to our organization through September 1st, up to a total of $2,500.oo Click here to donate now: DONATE Make a contribution right now and your money will be doubled by the Johnson Ohana Charitable Foundation! 5) Finally, please check out our Award Winning “Plastic and Recycling Awareness Curriculum” and share with schools and other community organization you know. Plastic Pollution is considered one of the largest environmental threats facing animals and humans globally and we need to start educating the next generation of leaders on how they can be the solution to the issue of plastic pollution.